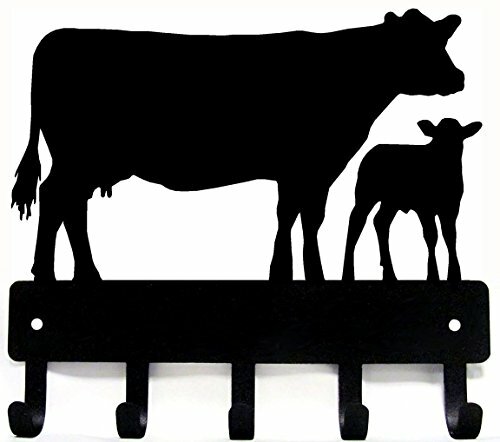 This great cow farm silhouette is cut out of 16-gauge American steel and has 5 rounded hooks. Small bag with 2 screws for easy mounting. Choose between the 6-inch-wide version or the 9-inch-wide version (if in stock). Both have 5 hooks. The hooks on the larger piece are a little wider and deeper, and are set further apart. Great quality. Made in Pennsylvania, USA! Great housewarming, birthday or Christmas or show prize for a cow lover, or for 4H & FFA clubs. View More In Home Storage Hooks. If you have any questions about this product by The Metal Peddler, contact us by completing and submitting the form below. If you are looking for a specif part number, please include it with your message.